South Florida Filmmaker | \ Movie Posters [Redux] \ Movie Poster REDUX: "A Charlie Brown Christmas"
With Christmas just a week away, this week's poster is a redux of one of the most beloved holiday specials of all time, "A Charlie Brown Christmas" designed by illustrator Tom Whalen (who also designed "A Charlie Brown Thanksgiving"). Making its debut on CBS in 1965, it was the first prime-time animated TV special based upon the comic strip Peanuts, by Charles M. Schulz. It has aired on television every year since. Bringing the Peanuts characters to television was not an easy task. With concerns over Linus reciting the story of the birth of Christ from the Gospel of Luke, the use of children to do the voice acting, the absence of a laugh track and the jazz soundtrack (by Vince Guaraldi), CBS programmers and executives reluctantly aired the special informing the production team, “We will, of course, air it next week, but I’m afraid we won’t be ordering any more." The special, however, was both a critical and commercial hit and has spawned numerous other Peanuts holiday specials. 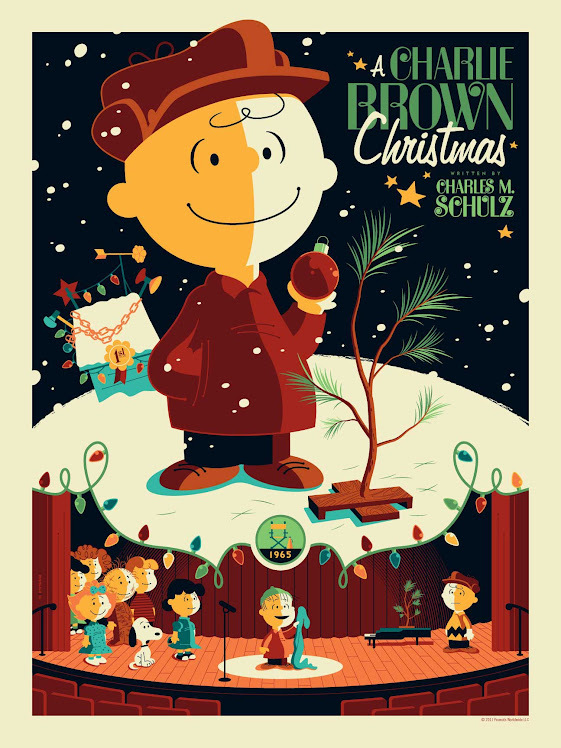 "A Charlie Brown Christmas" was produced and directed by Mexican-American character animator Bill Melendez, who was the only person Charles M. Schulz trusted to turn his popular comic creations into television specials. He and his studio worked on every single television special and direct-to-video film for the Peanuts gang with Melendez directing the majority of them. He even provided the vocal effects for Snoopy and Woodstock in every single production. To please Schulz, who couldn't fathom the idea of a beagle uttering English dialogue, Melendez recited gibberish into a tape recorder, sped it up and put the result on the soundtrack. Melendez died at his home in Santa Monica at the age of 91 on September 2, 2008. Bill Melendez Productions is still active and is currently run by his son Steven.